Please don’t chew on glowing green items, kids. Turtles may chew on glowing green items as much as they wish though, that's totally radical. If she intended to leave Selkie in the orphanage for weeks or at most a month or two only, letting her wear a nuclear reactor in her hair looks somewhat less irresponsible. And would likely be a very bad first impression on humans. Kuraimizu is right. Plo Quar didn’t say *anything* about coming back for her or that this was “temporary”. She wouldn’t have put her in an orphanage otherwise. Adoption is VERY MUCH different from Foster Care, which would have been the process followed if Plo Quar intended to claim her at some point in the future. Foster parenting is very much a temporary situation– those who foster and ultimately end up adopting are a rare breed. OTOH, Adoption is intended as a permanent solution and is approached as such. Lillian would have not only assessed Todd’s ability to deal with an 8 year old, but also to assess prospects for college, teenage issues, puberty, and so on. Foster parents are caretakers. Adopters are PARENTS. obJustification: Father did this for a living, bla bla bla. Would she have known all this? From the flashback (which i had no lock finding 🙁 ) I think I remember her barely speaking english at that point. The whole thing seemed very spur of the moment or act of desperation, which would explain and somewhat excuse things like not even telling the humans vegetables make her sick amongs other things. One thing leading to this being intended to be permanent is that we have seen Plo Quar just walking amongs humans seemingly freely recently, though. When was this, I vaguely remember something like this but can’t remember when and where. In the background of a scene with Todd’s siblings. Look for strips tagged with her and you should find it. Okay Selkie MAY not be a witch, BUT she is definitly outputing some mighty energy to make that thing run. So was it intentional for the device to run to…what hide her energy? 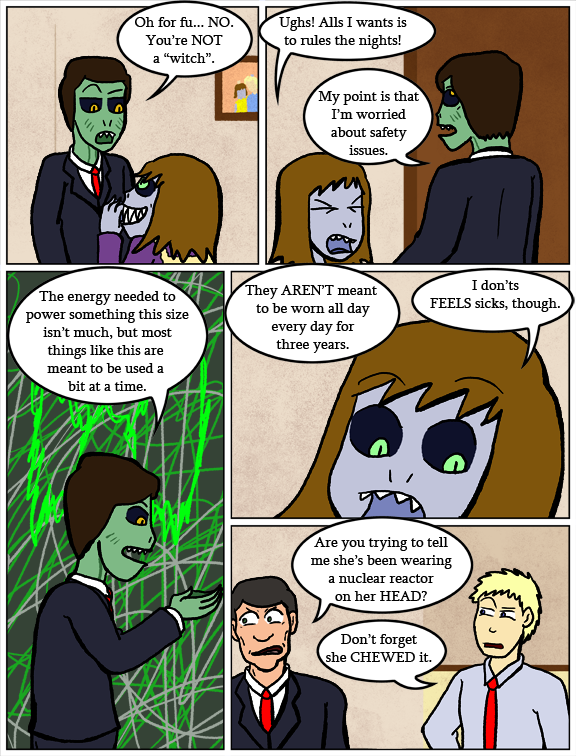 or was it…to stifle her energy growth output? My guess would be both. In doing the latter, it would insure her energy signature could never be traced. 3. Preventing other sarnothi from recognizing selkie as an Echo. Or a combination of those theories. So it’s like the Fortress of Solitude for Kal-El? Cool! Wait, are you guys trying to tell me she’s a Heterodyne? please say you’re a Hammie! Is that to imply this may have impacted Selkie’s health? To be fair he didn’t know she had it until now. But he’s kept them completely in the dark about what she even IS, and didn’t want Pohl to inform them…. then at the beginning of this arc, shamed Todd for NOT having followed up with more info from Pohl. Getting them in touch with Pohl was so he could inform them about things agent Brown can’t, while maintaining plausible deniality. To be fair, in the scene with Pohl, he mentioned that HE gets in big trouble if people found out. And in the scene at the PTA meeting, where the Sarnothi guy shows up, he seems a little nervous around him. Like, Brown has been so intimidating with his super-secret secret agent bit, that Todd was even scared to admit he’d gotten any info at all from Pohl, and Ms. Mary has also shown visible fear/intimidation of him when Todd only saw Brown’s name on a paper. But if we don’t chew on it, how will we know what death tastes like? Yes,get rude at the kid who just thought that was cool. Seriously. Just let her think she’s magic. Also I think he got his information wrong. Or he’s just trying to scare them into giving him the ‘dangerous bow’. No, I don’t think he has his information wrong. I think his assumptions about where the power source is are, though. I’m thinking the bow draws its power from Selkie, dimming her energy output, making her untraceable. I don’t trust this guy. He hasn’t been anything but shady since he first popped up. I don’t trust that he isn’t lying. I think he’s got an agenda and doesn’t care if a kid gets hurt. He could be lying. Which wouldn’t be hard to do. I agree that I don’t trust him, and that he would be willing to lie if he felt he needed to. But in this specific case, I think his facts hold up. I’m confused. Where are we getting the idea that Selkie is one of the few Sarnothi “highly receptive to the grid” or that the bow has been dampening down her huge latent powers? I was sort of assuming that as an eight-year-old her connection to the grid/mark on the world/perceived importance was so low that nobody was bothering to pay attention to her. Plo Quar might be one of these people, or might have a connection to one of these rare people who gave her the device she glued to the bow, but that doesn’t imply that Selkie is one of them. Chekhov’s gun alone is a pretty good argument, really. Awakening is implied to be something that happens to sarnoti – he’s not particularly shocked or surprised by the possibility. There’s no reason (other than her being the protagonist) to assume she’ll be particularly strong, but I think we can very much expect her to at least awaken soon, now that the bow will no longer be draining her. Also, the bow is supposed to protect Selkie. It seems like a possible jump that she is being protected from herself. the near- f-word slip raised my opinion of his character exponentially. I tip my hat your character’s complexities. this is awesome! Perhaps the guy is constantly running up against humans not knowing what Sarnothi are capable of and attributing things to them that to him are so obviously impossible that it has been dismaying him, and all the more so now when a Sarnothi child who he default assumes would know that witches are merely a human Halloween myth has no idea what is realistic. Kind of like humans brightly assuming that he can fly because cloaking devices exist, and on Star Trek it is space ships that use cloaking devices and they can fly. I also figure he might be off balance because it is hitting him more and more… there has been this super powerful-super dangerous device out there and he didn’t know it…. Crap! Plo Quar might show up at any moment and shoot him in the gills, because she might know the device exists and use it to monitor Selkie! And Plo Quar has killed hundreds of Sarnothi who she things have threated the Jin Sorai, let alone her very own only daughter…! This might perhaps not be the moment he wants to spend explaining that human stories about cauldrons and magic potions are just human stories and where in the world did the child get that idea?? Bad enough that he has to suddenly figure out how to explain the device to his Partner-in-Black without saying too much and yet make him understand that their life force might be drained/a major civil war battle might be about to being in Todd’s apartment which will take out the neighbourhood and make concealing the existence of the Sarnothi moot/they will have to do an immediate factory reset on the device or it will invalidate the warranty due to lack of routine maintenance/he has come into the presence of that-which-invokes-the-Gods/he never realised he would feel so guilty about the genocide of the Jin Sorai that just looking at one would make him dizzy/etc. In trying to guess what Selkie’s bow is going to turn out to be, we have three sources of information: Pohl, Then, and Plo Quar. The first two reacted with alarm — based on generalizations about the technology, but before having any chance to examine this device in detail. Plo Quar, on the other hand, placed the device, knew exactly what it was, and told her beloved daughter Selkie to wear it always. Until I have actual evidence to the contrary, I’m going to go with the theory that Mother Knows Best. She left her beloved daughter with people who had no idea what to feed her and had to trial and error to the fact that fruit makes her sick. TBH Plo Quar might not have had much options. Anywhere else that had Sarnothi children might’ve been a bad thing. I mean she seems to be very infamous and considered a threat. DX So this might’ve been for her safety? The Mother Knows Best trope can and has been abusive or very mislead in many cases. I don’t think she’d actively abuse her daughter… but she may believe in her own convictions so strongly that she’d put her own daughter at risk to prove a point if she thinks she’s right. We know literally nothing about her mother aside from very vague things. She’s a War Criminal but no one really knows if she was truly righteous or malicious. Personally, I’d like to think Selkie’s mom isn’t actually that good of a person or that she made some really misguided and maybe even a bit sadistic choices in her past for what she believed was right. So far everything associated with Selkie’s family is just good people who show very little character flaws or are shown to try and justify the flaws they have by saying they were unjustly wronged. I believe this is simply because Selkie is the protagonist and we are supposed to associate her and her friends and family as inheritly good in whatever choices they make. If her origins and mother are of a less than savory background, I think that makes Selkie ten times more interesting, to me, at least. I hear what you’re saying… but in the little we’ve seen of what Selkie remembers of her mother, it’s happy memories, except for the parting. I think the main evidence that Plo Quar was a loving mother is that once out of the orphanage, Selkie mostly bounced back to being a cheerful, imaginative, energetic, mischievous eight year old. Maybe a bit vengeful, but… she isn’t nearly as deeply scarred as Amanda. This suggests to me that she was loved and cared for in her very early childhood years. She had love as a base. So I am inclined to give Plo Quar the benefit of the doubt until proven otherwise in the comic. No idea why she left Selkie at the orphanage the way she did, but I am willing to entertain the notion that there were circumstances that made that the best option. She would not have left her daughter with a device that she thought would be harmful. And… she would have to have known what the device was. Then and Pohl are only guessing. Or she could have gone with what she at that time thought was the lesser of two evils. Like maybe she thought having the devices drain her powers was seen as better then having her start glowing green at random. Even people who genuinely mean well can make bad decisions or simply be wrong about things. Rather than wearing a nuclear reactor, it seems like Selkie IS the nuclear reactor.